When designing your home theater, it’s important to remember that a proper carpet really ties the room together. 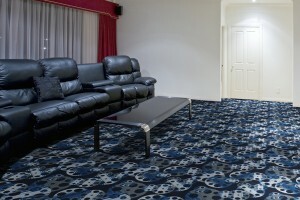 HTmarket.com carries a full line of home theater carpeting which is designed expressly for home theater use, and which features stylish and thematic patterns that invoke the feeling of stepping into your own personal cinema. What’s more, they’ve just added several new styles of home theater carpet, such as the classic Cinema Star, the luxurious Walk of Fame style, the cool Reel style (seen below), and my favorite, the fun and modern Searchlight style. With so many styles of home theater carpet to choose from, with most available in several color variations, you’re sure to find a style of carpet that fits with your home theater… or a style worthy of designing your home theater around, for that matter!